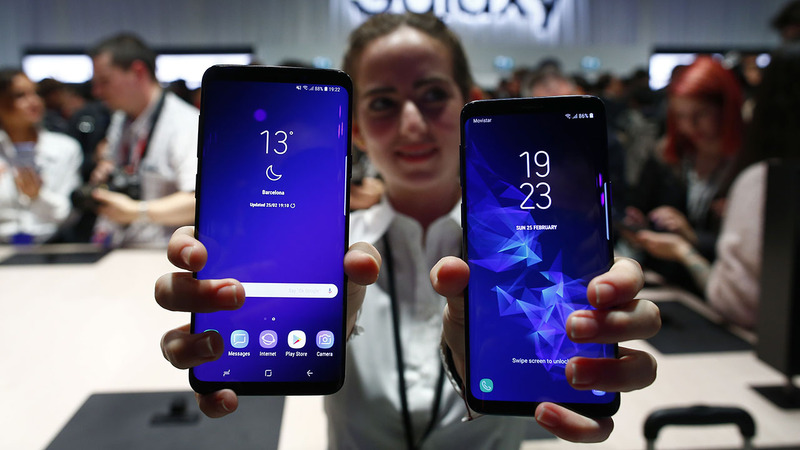 NEW YORK -- Samsung unveiled new smartphones with largely unchanged designs and incremental improvements such as a better camera - accompanied by a second annual price increase for many customers. The static design of the new Galaxy S9 underscores both the slowing pace of smartphone innovation and the extent to which other manufacturers, particularly Apple, have caught up with Samsung features that once stood out. That includes everything from edge-to-edge screens to facial recognition to a water-resistant body. The new phone's biggest selling point is a collection of minor improvements to its camera, which is already among the best in the smartphone business . The S9 promises even better low-light shots, while offering a video mode that appears to freeze fast-moving objects, matching a feature in some Sony phones. The S9 can automatically detect when there's high-speed motion to record, such as a cork popping off a bottle of champagne. A fifth of a second of video gets stretched out into six seconds. While single features like this aren't likely to drive buying decisions, the slow-motion effect could be "the kind of thing that will get a lot of attention," said Bob O'Donnell of the research firm Technalysis. For the first time in a major phone, the S9 will let you change the camera's aperture to let in more light, making for better images in dark settings. But analyst Carolina Milanesi of Creative Strategies warns that despite the improvements, the new camera is competing with already good cameras in earlier Samsung phones. Nonetheless, you may have to pay more, though nothing quite at the level of last year's $100 price hikes for the Galaxy S8. In the U.S., Verizon, AT&T and Sprint are raising prices from what the S8 cost at launch - to nearly $800 for the regular-size S9 and more than $900 for the larger S9 Plus. As people hold onto phones longer before upgrading, price hikes let manufacturers and carriers make up for lost revenue. Some of the increases will be offset with promotions. And T-Mobile will cut prices from last year's models. You can also buy unlocked versions more cheaply directly from Samsung - $720 for the S9 and $840 for the S9 Plus - though most people in the U.S. buy through their carriers. The new phones were unveiled Sunday in Barcelona, Spain, and will be available March 16. Advance orders begin this Friday. - UNCHANGED: The S9 features the same screen, same virtual home button and same battery capacity as the S8. Samsung did move the fingerprint sensor on the back to reduce smears on the camera lens. - A SECOND LENS: The camera on the Plus model now has a second lens with twice the magnification, a feature already available in Samsung's Galaxy Note 8 and some iPhones. This means sharper close-ups. - FUN WITH SELFIES: Snap a selfie, and Samsung's software will turn that into an emoji version of you for sharing. It's usually a static image, though you can produce an animated version - much like the iPhone X's Animoji feature. - VISUAL ASSISTANT: Samsung's Bixby digital assistant mimics a similar Google feature that pulls up information on landmarks or other items you've just photographed. New Bixby capabilities let it instantly translate signs (point the camera, and the phone replaces the sign's text in a matching color and font) and provide nutritional info for that restaurant meal you're splurging on. Is buying a used smartphone a good deal?